Present state: Demolished. The goods shed is extant. In its earlier years the station name was ‘Ferry Hill’ in some timetables. The Clarence Railway was the first to provide a (horse-drawn) passenger service to Ferryhill on its route between Stockton-on-Tees and Crow Trees (also referred to as Quarrington). When the York, Newcastle & Berwick Railway opened its route through Ferryhill on 18 June 1844 it is not known whether the existing Clarence Railway station continued to be used alongside the YN&B. The route taken by the railways used a north-south gap through the East Durham plateau, which required enlarging by the Clarence Railway company: a huge cutting 75yd wide and 67ft deep was excavated. This route left Ferryhill village almost a mile north-west of the station(s). The YNB station building was west of the tracks on the down platform. As with others of this company’s stations G. T. Andrews was the architect. Set at right angles to the tracks it was a handsome ashlar building bearing his hallmarks, but the exterior elevation was stepped forward, lacked a porch and had a small gable rising above an arched first-floor window. A single-storey range abutted the main building and stretched northwards along the platform. The development of Ferryhill as a nodal point on the network increased its importance, and this was particularly so when the opening of the Ferryhill – Durham link in 1872 added a further route which became the East Coast main line, superseding the ‘Old Main Line’ via Leamside. The inadequacy of Ferryhill station required its rebuilding in 1876, and the design was executed during Benjamin Burleigh’s short tenure of the NER Architect post. Brick was used in its construction, and pointed arches were used on window openings to add a touch of refinement. In the process the existing station building was retained but used only as the stationmaster’s house; with some alterations and additions it survived in this role until the 1960s. Although a small community was developing close to the station, and Ferryhill village itself was growing, the design of the new station reflected its role as an interchange point, rather than one serving only the local community: the earlier rebuilding of Leamside was a similar case. As at Leamside a broad island platform was the principal feature; at Ferryhill it was 290yd in length with two-road bays set into each end. The platform was reached by a staircase from the road bridge which crossed the site. Fawcett (2003) notes that the platform was sheltered by a large expanse of glazed ridge-and-furrow roofing, with the low office range almost hidden in the middle. He also refers to the complications with the building contract which was awarded in December 1875 to the lowest bidder, Robert Weatherley of York. Owing to a mistake on Weatherley’s part, in January 1876 J Whaley of Durham took over the contract but was no longer prepared to keep to his tender, and the contract was returned to Weatherley at £500 over his original bid. The timetable summary below indicates the importance of Ferryhill as a junction, with seven routes radiating from the station. The Coxhoe service was always sparse and followed most of the Clarence Railway route to Crow Trees / Quarrington. Coxhoe lost its passenger service in 1902 but continued as a goods depot until the 1960s. The engine shed and goods yard were immediately north-west of the passenger station, reached by several sidings from the north. The 1904 RCH Hand-book of railway stations indicates that Ferryhill possessed the normal range of goods facilities including a one-ton crane and a large number of associated industrial enterprises that brought traffic to the railway; these included the NER Company gasworks, two limestone quarries with lime works, a sand quarry, a colliery, and engine works and three slag works. A livestock auction mart was also established immediately east of the passenger station. In 1923 the NER system became part of the new London & North Eastern Railway. The passenger services provided by the LNER in winter 1937-8 are summarised below. The local passenger services between Ferryhill and Leamside were earmarked for withdrawal by the LNER in 1939, but they survived until 1941. In January 1948 the East Coast main line between Shaftholme Junction (Doncaster) and the Scottish border and the other former NER lines became part of the new nationalised British Railways’ North Eastern Region. Early in this era the ridge-and-furrow roofing gave way to much simpler steel-framed awnings. Whilst the LNER running-in nameboards with metal letters on wood were retained, in the early 1950s BR fitted totem name signs and replaced the casement-style gas lamp standards with Sugg gas lamps on curved pipes supported by concrete posts. In 1911 the North Eastern Railway recorded 17,394 tickets issued at Ferryhill. By the standards of the day this was not a large number, but, as noted earlier, Ferryhill was inconveniently located for the village, and much of its traffic will have involved passengers changing trains. Whilst most stations saw a substantial decline in bookings by 1951, Ferryhill’s figure rose slightly to 18,229. At this time Ferryhill was still the junction with the East Coast main line for passenger trains to Stockton, West Hartlepool and Spennymoor, but each of these routes closed in 1952; thereafter Ferryhill was served only by trains on the main line. In March 1963 the Reshaping of British Railways (‘Beeching’) report recommended the closure to passengers of Ferryhill station, but it was not until 22 November 1965 that the formal closure procedure began. The Transport Users’ Consultative Committee was supplied with data gathered in the week ending 10 July 1965 revealing that 24 passengers joined and 19 alighted from northbound trains, while 19 joined and 25 alighted from southbound trains. Average summer 1965 figures suggested that there were ten regular northbound and two regular southbound users of the station. 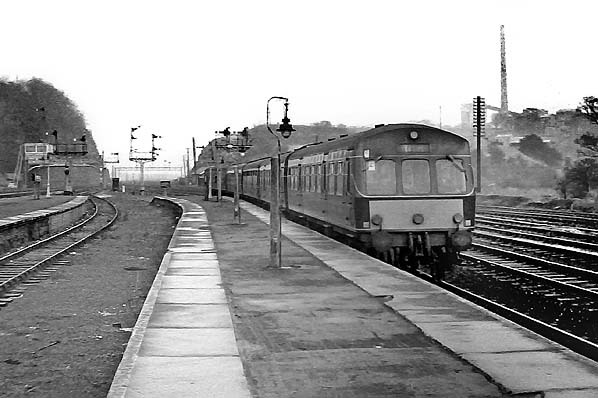 There had been a decline of one-third in passengers using Ferryhill station since 1961 when approximately 16,000 tickets were issued, falling to 10,500 in 1965. The committee noted that the station was badly sited for the community centred on the A1 [now A167] with 65 buses on Monday-to-Friday and 83 on Saturday serving them. There were also operational difficulties for stopping trains at Ferryhill. Trains from the south had to leave the down main line, cross the up main, then travel half-a-mile before entering the platform. On leaving the station they then needed to re-cross the up main line. This procedure was stated to add 6½ to 7 minutes to the journey time. There were 22 objections to the closure of Ferryhill station. The TUCC hearing ended on 17 March 1966 and their report, dated 18 April was delivered to Barbara Castle, Secretary of State for Transport two days later. 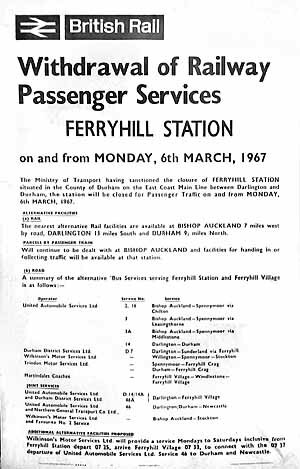 On 12 December she consented to the closure, and Ferryhill station closed to passengers on 6 March 1967. The final timetable for the station is shown below. It will be noted how irregular the service was, including a twelve-hour gap in the northbound service on Monday-to-Friday, during which time on a Saturday there were three train calls. Goods services continued until at least 1984; the precise goods closure date has not been found. 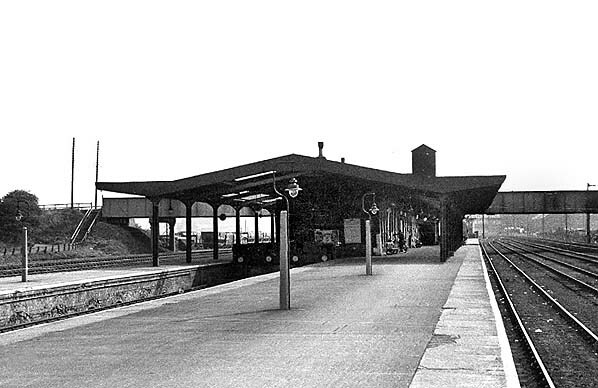 Ferryhill station was demolished soon after closure, with nothing remaining of the platforms and buildings by 1972. It is possible that Ferryhill might become a passenger railway junction again some time in the future. There have been campaigns – for example in 1989 – for services on the route from Ferryhill through Sedgefield to Stockton to be restored on the former passenger route, which has been used only by freight and occasional diversions of main line trains since it closed to passengers in 1952. In addition, although it has recently been closed and lifted, there are calls for the ‘Old Main Line’ to be reopened, not least because the large new town of Washington could be served. Tickets from Michael Stewart (except 7114 JC Dean) Bradshaws from Chris Totty & NER timetable Alan Young. Totem from Richard Furness. Route maps drawn by Alan Young. 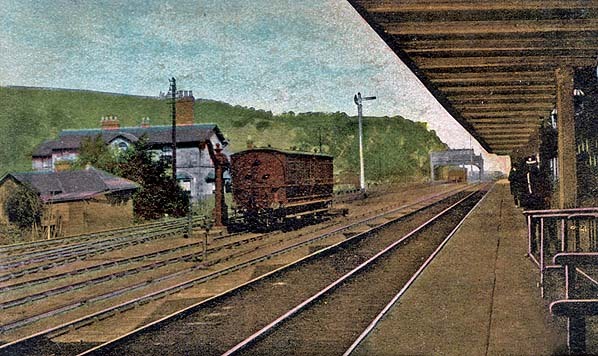 The 96yd southern bay platforms at Ferryhill station looking north c1905. The ridge-and-furrow awning is a particularly attractive feature. 1897 1:2,500 OS map.In 1897 Ferryhill station was an important junction on the East Coast main line with passenger routes to Bishop Auckland, Durham, Leamside, Coxhoe and West Hartlepool converging from the north and the Darlington and Stockton lines entering from the south. Apart from the eight through lines there are extensive sidings south-east of the passenger facilities as well as to the north-west, where there is also a three-road loco shed (adjacent to ‘Old Quarry’) with turntable. The Mainsforth quarry and lime works are served by a short branch heading north-east from the station. The passenger station layout can be seen clearly with its 290yd island platform with two bay platforms set into each end. The platform roofing is shown with diagonal shading, including a section south of the road bridge to cover the up platform face and one bay. No detail of buildings below the roofing is given. The old station building is shown west of the tracks. The village of Ferryhill Station has grown substantially, well supplied with public houses, and a livestock auction mart adjoins the station. 1920 1:2,500 OS map. By 1920 the neighbouring village has acquired some more terraced housing and the Mainsforth quarry has expanded. 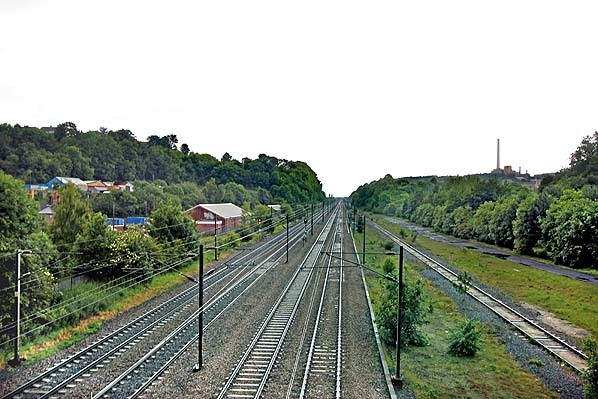 The railway facilities, already extensive in the earlier map, have changed little in two decades. 1961 1:2,500 OS map. The only railway passenger services through Ferryhill in 1961 are on the East Coast main line, and few of these actually stop here; the five other passenger routes converging on Ferryhill have closed, although each still carries goods and mineral traffic. The loco shed has gone, and only the siding with a turntable remains of the lines that served it. The platform roofing has been removed south of the road bridge. In the forty years since the earlier map was published the village has grown a little, but its raison d’être – the station – would close in 1967. Looking north up the west face of Ferryhill station's island platform c1905. The original station building can be seen to the left. 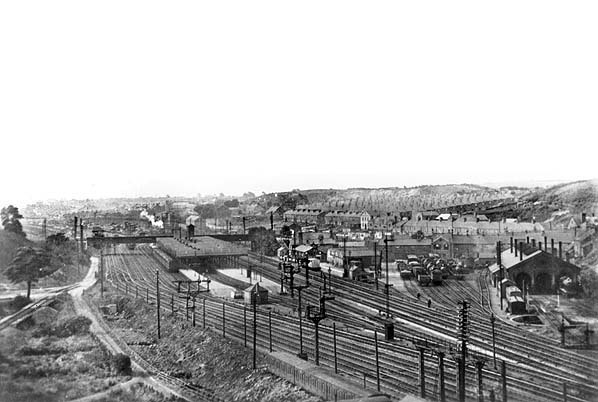 A vantage point north of Mainsforth Quarry affords a superb general view southwards of Ferryhill passenger station, its goods facilities and loco shed (right) probably in the 1930s. 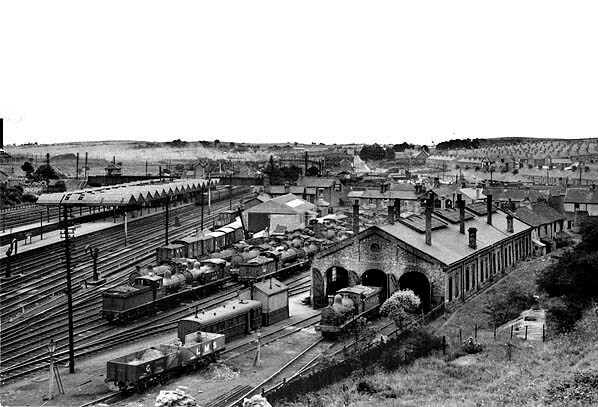 Looking south-east across Ferryhill station in August 1936. 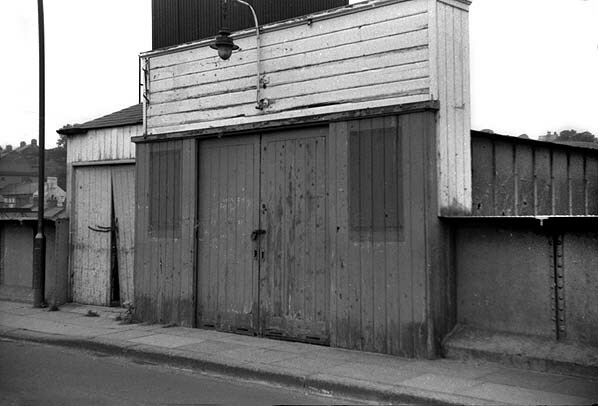 The three-road locomotive shed is seen on the right; it was to close in November 1938 and be demolished in 1954. Beyond it, to the left, are the extensive and busy goods facilities and the passenger station. Ferryhill station looking south c1950. 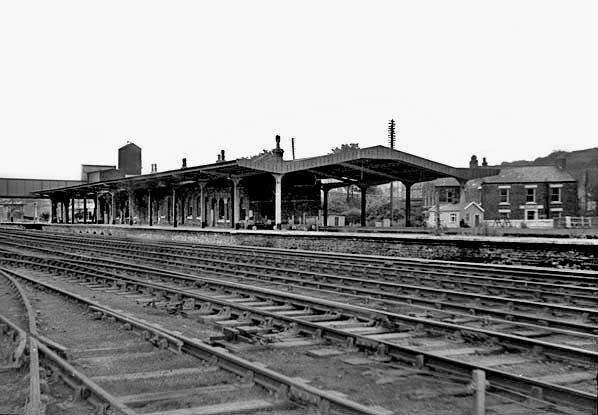 The extensive ridge-and-furrow platform roofing soon gave way to a much plainer design in the early BR era. On the down slow line, hauling the passenger train is a Gresley 2-6-2 Class V2 mixed traffic loco. It has a very large nameplate. At the time there were only seven of the 184-strong class that were named. With such a large nameplate this loco is likely to be 60809 ‘The Snapper’. 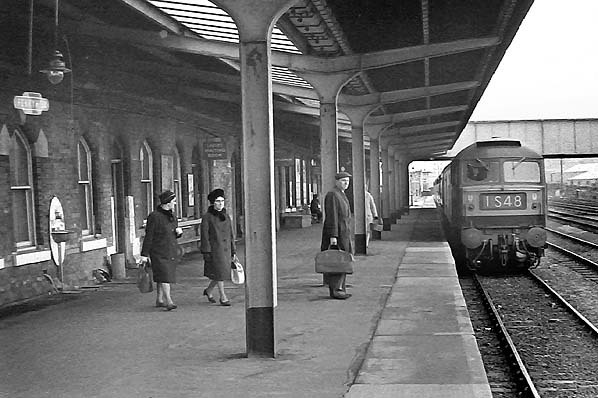 A G5 is waiting to depart from the bay platform, probably to take its train through Trimdon to West Hartlepool or to Spennymoor; both routes closed to passengers in 1952. Seen in a north bay at Ferryhill c1952 with a local passenger working, either to Spennymoor or West Hartlepool, is auto- fitted G5, 67305. This 0-4-4T was designed by Worsdell for the NER and built in November 1897 numbered 1755. Re-numbered by the LNER in 1946 and BR in 1948, it was withdrawn from 52F, Blyth North shed in December 1958 and scrapped shortly afterwards. The platform roofing is newly installed by British Railways. In the background (right) is the original 1844 station building and the adjoining office range. 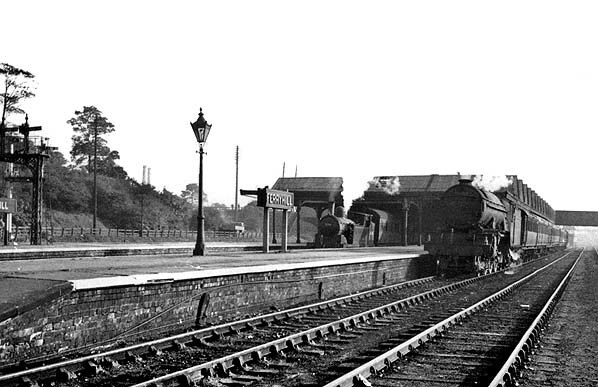 Ferryhill station looking north c1955. Only a single track remains in the southern bay, and the ridge-and-furrow awning has been removed. Local trains to Stockton used these bay platforms until they were withdrawn in 1952. 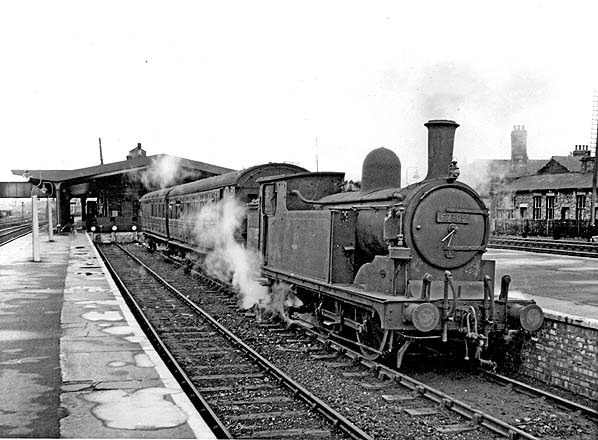 Ferryhill station in 1955 looking south along the down face of the island platform. 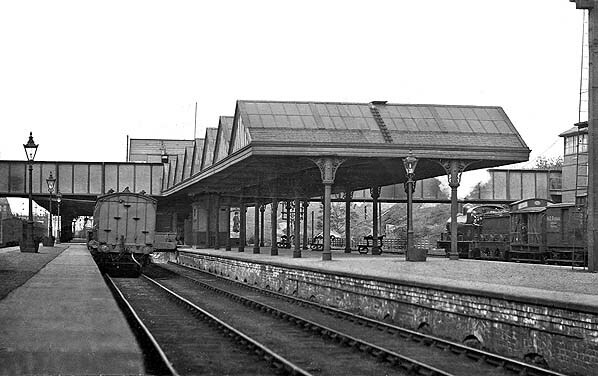 Note the recently installed platform roofing also the gas lamps inelegantly mounted on concrete posts – a feature of BR(NE) ‘modernisation’. A Metro-Cammell Class 101 DMU from Newcastle arrives at Ferryhill on 25 February 1967 to depart for Leeds City at 11.41. Brush Type 4 No.D1102 arrives at Ferryhill with the 10.00 York to Edinburgh stopping service on 25 February 1967. To reach the platform the train has had to cross the down main line and must re-cross it to continue its journey north. Beneath the modern steel-framed awning with its unadorned pillars, the gas lamp, totem name sign and drinking fountain can be admired. Ferryhill station looking south-west in June 1968, a little over a year since it closed to passengers. 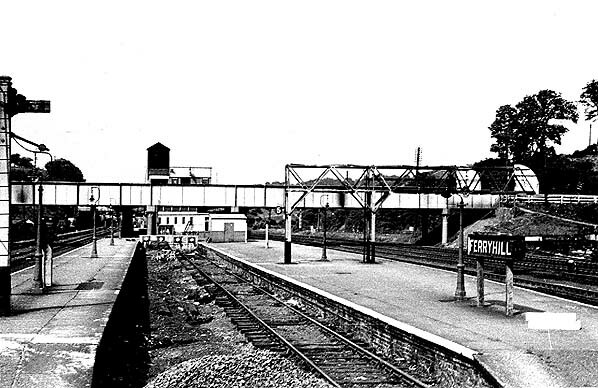 In June 1968 the entrance to Ferryhill station from the road bridge is firmly shut, 15 months after closure to passengers. This is a particularly charmless entrance to a station which was formerly of considerable importance; it contrasts markedly with the dignity of the original station building of 1844.
left of the railway tracks.